In Spinster by Kate Bolick, we are taken on a journey of learning. The journey is at times conflicted, at other times self-confident, at other times questioning, but it is mostly a journey of learning, of understanding spinsterhood. Bolick redefines “spinster” for everyone who reads this book—women and men alike. She begins the book with some background and statistics about marriage in America and the history surrounding it. 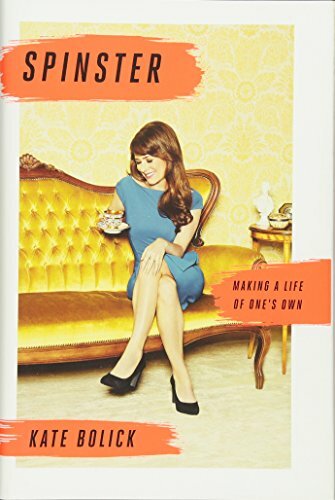 She continues to plow down that path to focus on who and what, exactly, is a spinster, and she relates this information as it applied to her growth and understanding of such a position in American Life. Although her awakeners arrived from different eras, and experienced life differently—some married, some not, some sexually indifferent to their choices of lovers, each carried with her the distinct life of an individual—each fiercely independent. It is easy to understand Bolick’s draw to these women as she journeys to find out what spinsterhood is really all about. Ms. Bolick refers to her growing understanding of spinsterhood as her “spinster wishes”—not that she particularly wants or does not want to be a spinster, but as the thoughts that take her on this journey. And it is a journey of ups and downs as she questions her decisions but progresses forward nonetheless. Throughout the book she wavers about her “spinsterness”—was it something she desired or something she could not tear herself away from? The issues of loneliness and taking care of oneself are key to her discussions with herself. And through her search for a better understanding of being independent, there is always the tug of marriage tapping her on the shoulder, beckoning her to indulge. Falling in love and falling out of love came with the territory, and Bolick clearly expresses the confusion and anxiety that accompanies a failed romance . . . especially when that failure is due to questions of one’s grasp for independence lurking in the dark corners. Peppered throughout the book are stories of other minor, but nonetheless influential women who tackled independence with varying degrees of success. The journey continued as the divisions between married and single women clarified for her. Everyone should read this . . . now . . . don’t let another moment pass by, especially if you are of the mind that the frumpy old lady still exists. She doesn’t!